You know why cartoons about sea life are popular with kids? It’s because animators use adorably stylized versions of actual sea creatures, which are in reality completely horrifying. 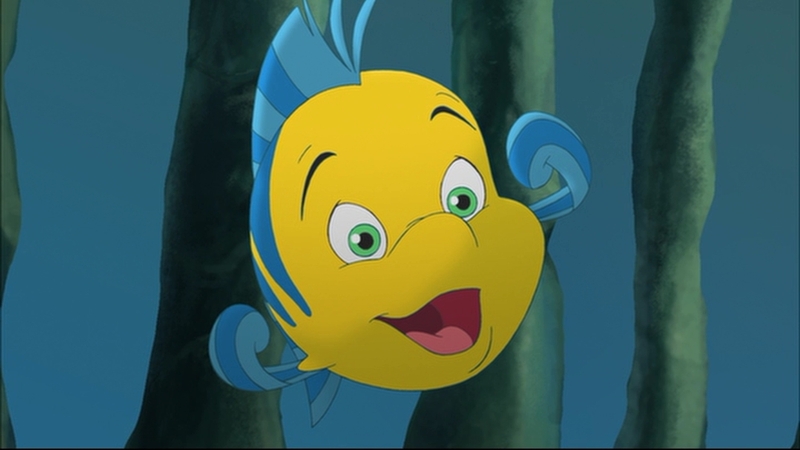 (Seriously, compare The Little Mermaid’s Flounder to an actual flounder. Ew.) But an international group of scientists has just found a legitimately precious sea creature, and it just so happens to be the new world champion for Earth’s deepest dwelling fish. A 30-day expedition to the bottom of the Mariana Trench – the deepest known point on the planet – uncovered a lot of fascinating sea life, but this wispy, angel-like little fella is unlike anything researchers have seen before. 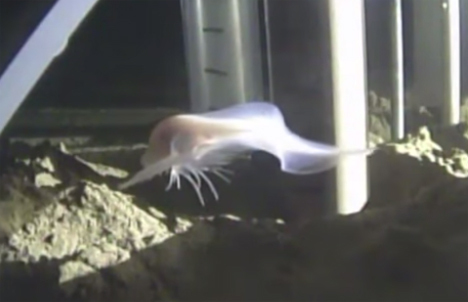 Scientists involved in the expedition believe the ghostly creature to be a newly-discovered type of snailfish, though they admit that nothing like it has ever been seen before. The team wasn’t able to capture a specimen for examination and did not name the new species. The ethereal fish, with long, wispy fins and an impossibly cute cartoon-like face, was recorded swimming some five miles beneath the surface of the ocean. 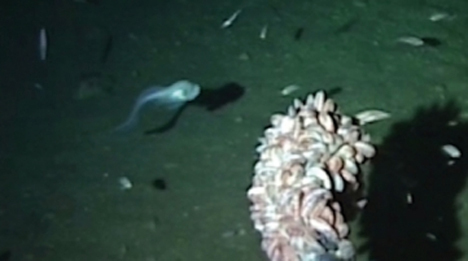 That’s a good 500 meters deeper than the previous “deepest dweller” record holder, also a snailfish. Co-chief Scientist Dr. Jeff Drazen from the University of Hawaii said of the expedition, “Many studies have rushed to the bottom of the trench but from an ecological view that is very limiting. It’s like trying to understand a mountain ecosystem by only looking at its summit.” This trip to the bottom of the sea was unique in that the researchers weren’t just interested in what was at the very bottom of the trench – they gathered information all the way down, setting new depth records for several known species of fish. As for our little angel-faced friend up there, hopefully future expeditions will be able to tell us a little more about how he deals with the crushing pressure of life at five miles under.